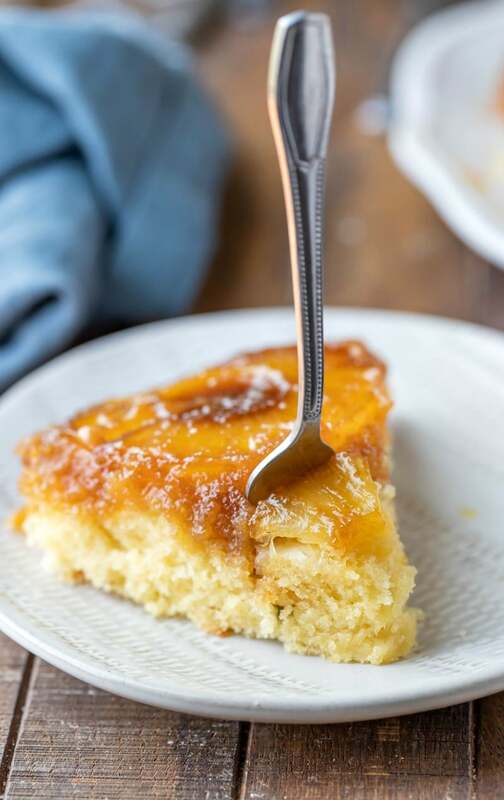 Easy homemade pineapple upside-down cake recipe! 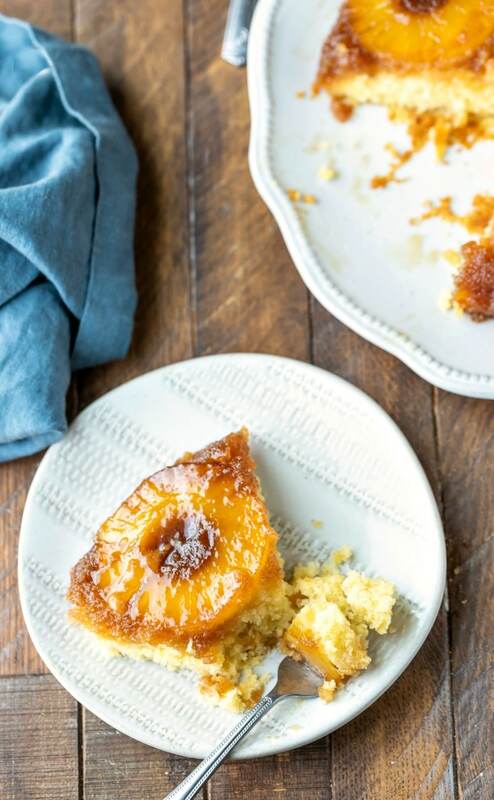 This one-bowl homemade pineapple upside-down cake can be made from scratch and in the oven in 10 minutes. Published 3/22/16. Updated with new photos and tips 4/11/19. It’s funny how much more important tradition has become to me since I’ve had kids. There are lot of foods that I find myself making because that’s what my mom made for me. I love being in the kitchen telling my kids about cooking with my mom and making the same things for them that she made for me. 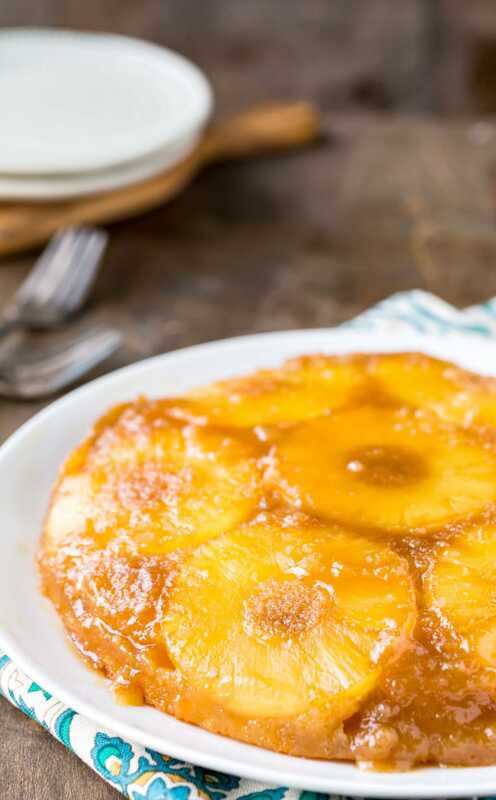 This Pineapple-Upside Down Cake was one of my favorite desserts while I was growing up. It’s so simple to make – only one bowl and about 10 minutes of prep. 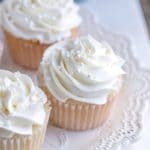 It’s such a homey, satisfying dessert, and it’s perfect for throwing together whenever the urge for some cake strikes. 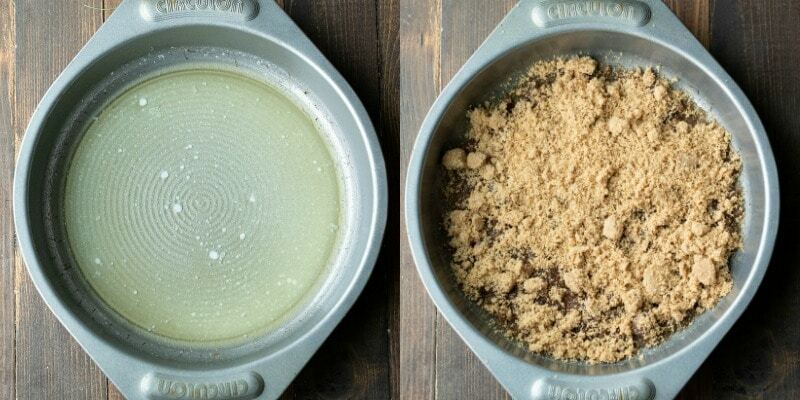 Begin by adding melted butter to the cake pan. Top the melted butter with brown sugar. Add the pineapple slices to the pan. I add one to the center, and then I fit the other rings around the center piece. It takes 7 pineapple rings total. To make the cake, add the ingredients to a mixing bowl, and mix just until combined. Don’t overbeat the batter! The batter will end up rubbery if you overmix it. Pour the batter over the pineapple in the cake pan. The pan will be pretty full (about 3/4). I haven’t had the batter overflow, but if you are concerned, you can bake the cake on top of a cookie sheet to catch any overflow. Let the cake cool in the pan, and then invert to serve. Be careful not to over-mix the cake as this batter will become rubbery. The pan will be fairly full going into the oven. However, I’ve never had this cake overflow. If you’re worried about overflow, you can always put a baking sheet underneath the cake. The topping shouldn’t stick to the pan. If it does, simply replace the topping on the cake. 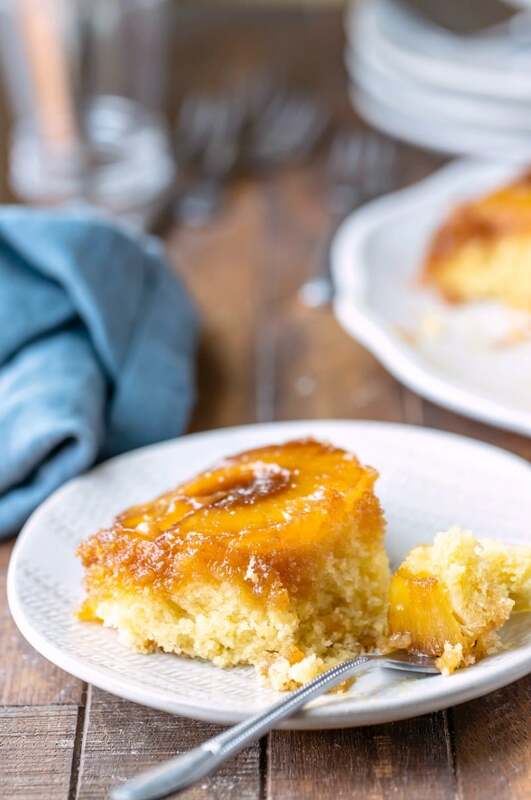 How long will pineapple upside-down cake keep? This cake is best eaten the day it’s made. The cake will keep for up to 3 days at room temperature. The cake can be stored, loosely covered, at room temperature. 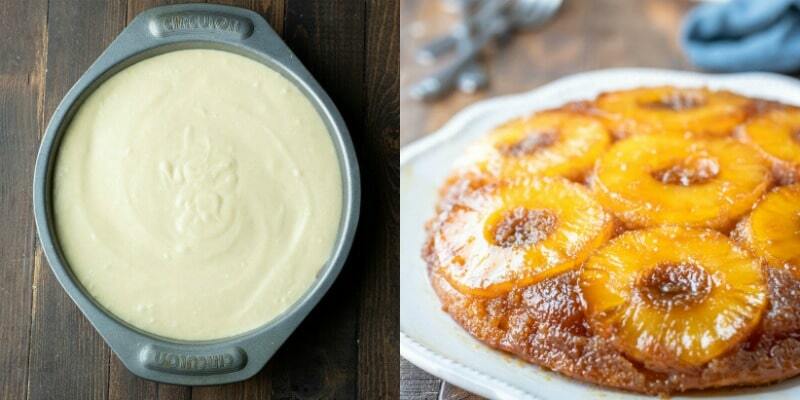 More homemade upside-down cake recipes! 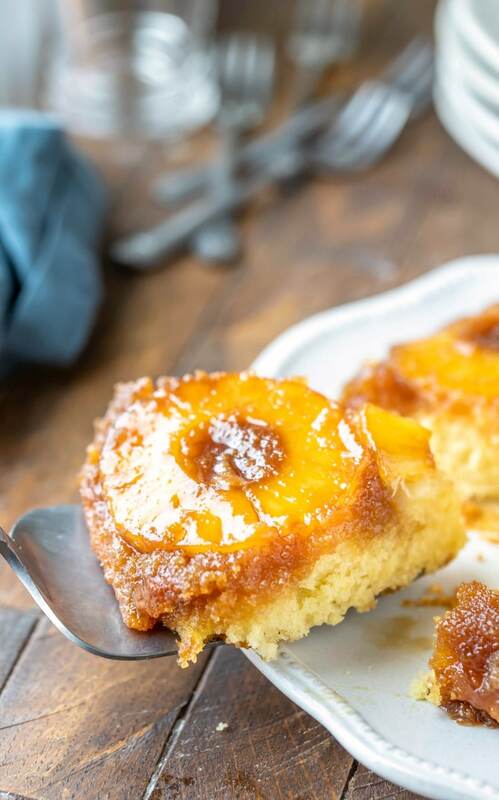 If you’ve tried this pineapple upside-down cake recipe, don’t forget to rate the recipe and leave me a comment below. I love to hear from people who’ve made my recipes! 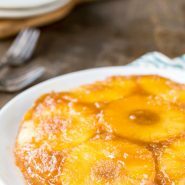 Gooey, buttery, brown sugar pineapple tops tender white cake in this classic Pineapple Upside-Down Cake recipe. Plus just one bowl and 10 minutes of prep! Melt butter in bottom of 9-inch round cake pan. Add pineapple slices over brown sugar. Set aside. Add cake ingredients to a large bowl. Turn speed to high, and beat on high for 1 minute. 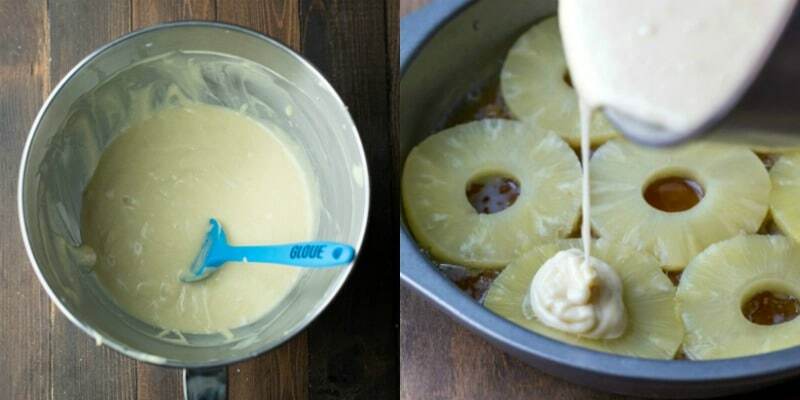 Pour batter over pineapple slices, smoothing as needed. Run a thin knife around the edge of the pan. Let cool to room temperature, and invert to serve. Anything from skim to whole milk will work. Dairy-free milks like almond milk will also work. 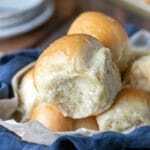 An equal amount of shortening can be substituted for the butter. The cake will bake up to the top of the pan. 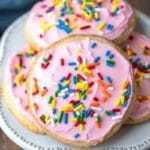 If you're concerned that the topping may bubble over, set the cake pan on a cookie sheet to bake it. Thank you! So glad that you liked it! Thanks for taking the time to come back and comment. 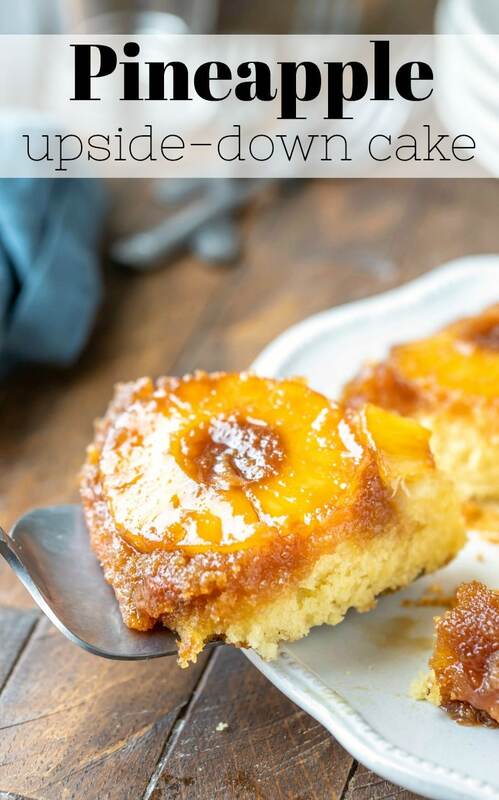 The sunny face of this upside-down cake says it all. Great idea! Pineapples are always a score!